This terracotta vessel has a flared rim and a ring handle. Under the rim, we see a band of ovules and dots, as well as a band of rosettes with white dots on the petals and yellow centers. A palmette appears under the handle, along with two broken bands. One band is composed of brown spiral hooks. The other band presents a simpler pattern in brown and black. On the body of the mug, we see a woman’s profile facing left. Her earrings, necklace, and diadem are rendered in white. This image of a woman surrounded by vegetal motifs is typical of the late fifth century BCE. On both sides of the woman’s face, scrolls are decorated with white and yellow dots. 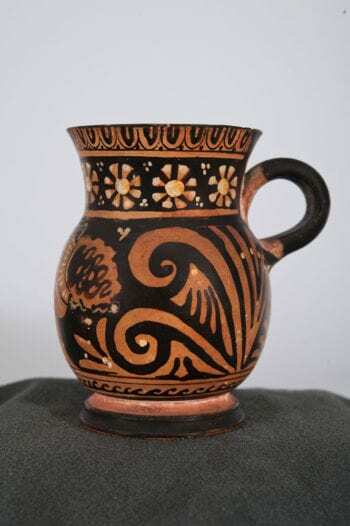 The compound foot of the jug is painted black. This vessel belongs to the earliest period of red-figure vase-painting in Southern Italy. Although this style of decoration originated in Greece, it quickly traveled to the workshops in Sicily and Southern Italy. There are five types of South Italian wares, named after the regions where they were produced: Lucanian, Apulian, Campanian, Paestan, and Sicilian. Similarities between the JHUAM vessel and an Apulian red-figure skyphos by the Armidale Painter in Berlin suggest that the former also originated in Apulia. The JHUAM vessel is, however, unusual since it features only one handle. Other vases produced in this shape and style usually have two handles. The vessel’s single handle and small size raise questions regarding its function. One possibility is that it might have been used as a drinking cup. 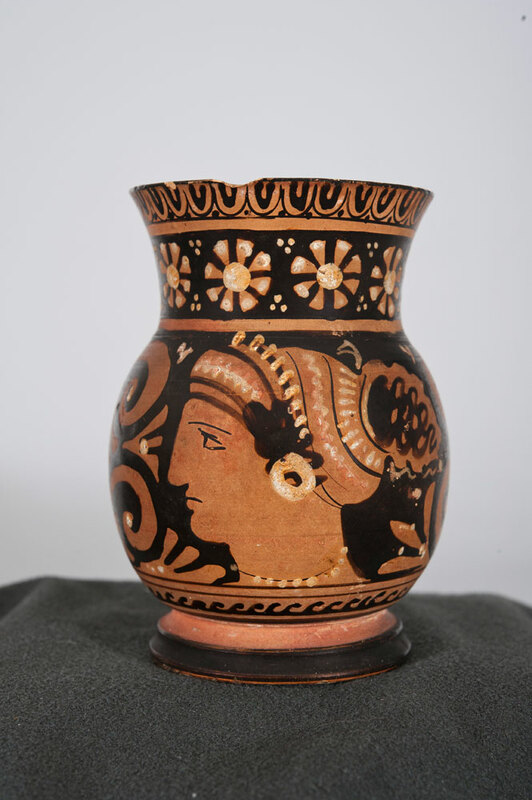 The woman depicted on this vessel is very well coiffed and self-possessed. She may represent either a goddess or an elegant lady. This choice of subject might be connected to the use of this drinking cup in a wealthy home. It might also be seen as evoking the grandeur of the symposium.